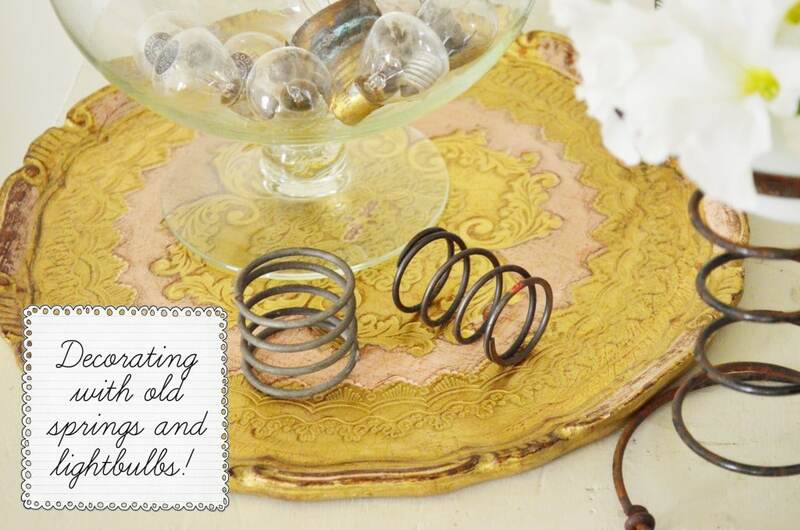 Decorating with Old Springs … and Light Bulbs! 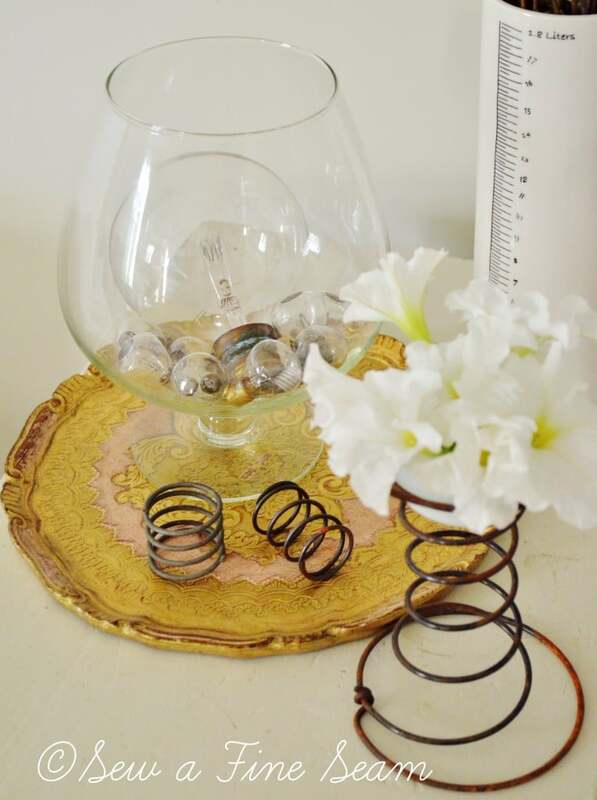 In my post last week about redecorating my 12 foot shelf I mentioned that I had some more decor to share with you – involving old springs and light bulbs. I used to have a huge light bulb that I bought at a cute little shop. It was a real light bulb but it was being sold as a decor object. For some reason it struck me and I bought it. You can see it in my Christmas dining table decor from a few years ago here. That light bulb got broke a few months ago. I don’t remember for sure what they said happened, but somehow the compote it was placed in got knocked off the shelf it was sitting on, and they both broke to smithereens. I wasn’t home at the time and my girls were a bit fearful of my reaction because they knew I really liked my light bulb. I was just glad no one had been hurt by raining glass. Light bulbs can be replaced. Eyes, and fingers can’t. At the family auction when my Mom and her siblings sold my Grandma’s things we also went through my Grandpa’s shop. Grandpa died about 10 years before Grandma and his shop was still sitting full of old, cool industrial stuff. I was the only female in there ‘shopping’ and excited about stuff. Everyone else thought I was bonkers. But I know some of you will ‘get’ it! And the springs. Have you seen the cool things people are doing with old springs? Type springs into the search on Pinterest and see what you find! They are metal, round, springy, and just cool 😀 Outside the back of Grandpa’s shop was a pile of junk. Just a mess of old junky stuff. But in that pile was a ton of old bed springs. I had found gold! My cousin, who was being our auctioneer, told us if there was anything we wanted to pull it out and he would sell it. I immediately said I wanted the springs. He said, “I’ve got 25 cents on the springs, does anyone else want them?” He waited about half a beat and said, “Sold.” My grin about split my face. And would you like to know something else? Springs are rather a hot item – just as I suspected. I took a basket full of them to the Springfield Flea with me in May. I sold them for $3 each and sold every single one I took. And had people coming back to ask if I had more. 🙂 I think my Grandpa would be quite pleased that I wanted his old ‘junk’. I can just hear him laughing if I told him about people buying the old springs. I would love to know why he had them – did he have a project in mind for them? Or did they just end up there in a pile of other stuff he got? He was always tinkering with something, making something, and he loved antiques and cool old ‘junk’. I think he would ‘get it’.! 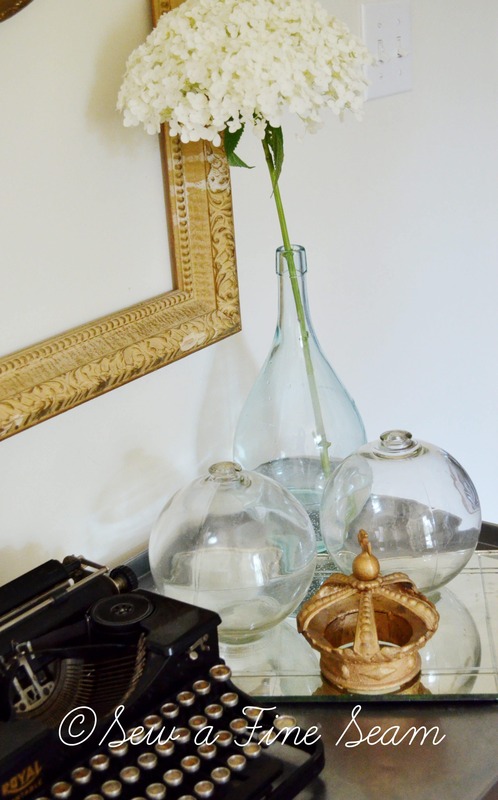 On another decor note – do you know what the clear round glass objects in this photo are? They are sealed – there is no opening in the top. I didn’t know what they were but thought they were cool. After finding out what they were I thought they were even cooler. So I bought them and added them to my summer decor. Get my posts in your inbox – sign up here! Whew. I think my comment button is fixed so you can comment again! That is so cool that you sold the springs!! I never heard and forgot to as you. I want one or two and I like the painted ones. I like the white, but I’m betting I could like a red or blue or lime green really well on the springs. Love the flowers in them. Love the old typewriter too. The video I just watched on the LPM blog of Beth Moore and Priscilla Shirer has some cool old suitcases and a typewriter. I think it is Priscilla’s home. The round glass things are old fishing bobbers used in fishing nets. I have plenty of springs and will get you and mom each some! i think Mom wants hers painted white too. 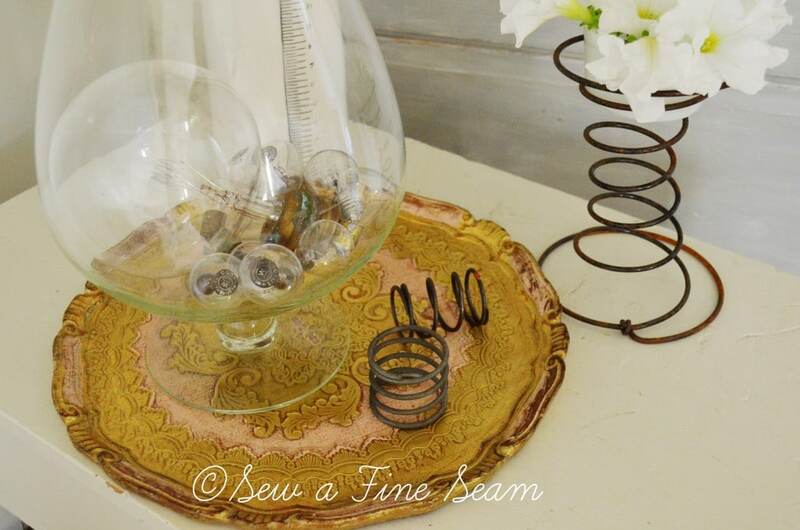 I love that vignette you made using old things! I’m really coveting that old typewriter too. 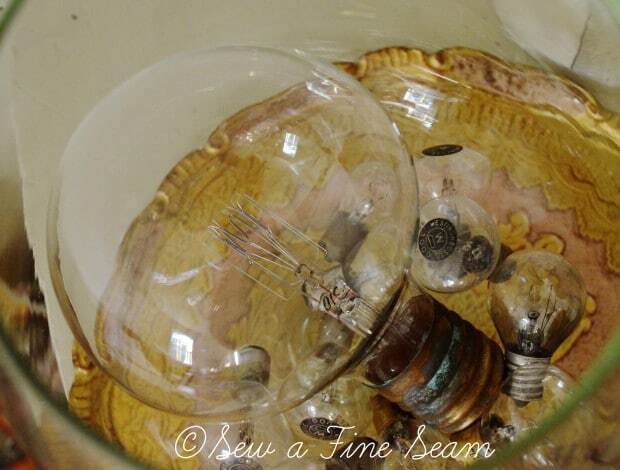 The idea of placing old lightbulbs in a clear bowl is so unique and I agree with you that using old springs is really cool! I’d take one! They add a bit of industrial chic to your decor. Thanks Kelly! I love my typewriter too! Hello: The glass balls are fishing net floats. My mother collected them for years in Hawaii long before it became a mega tourist place. They used to float to the beaches as they would come loose from the nets in the ocean. She also found some when she lived in New England, Rhode Island. While walking on the beaches, these glass balls would be in the sand. Most of hers were a beautiful blue, hand blown glass. I have a few myself and have them in my water fountain and in the fish pond. Neat inside the house too!!! Thanks for sharing. How fun to find these floating in to shore! They would be great in an outdoor water garden! 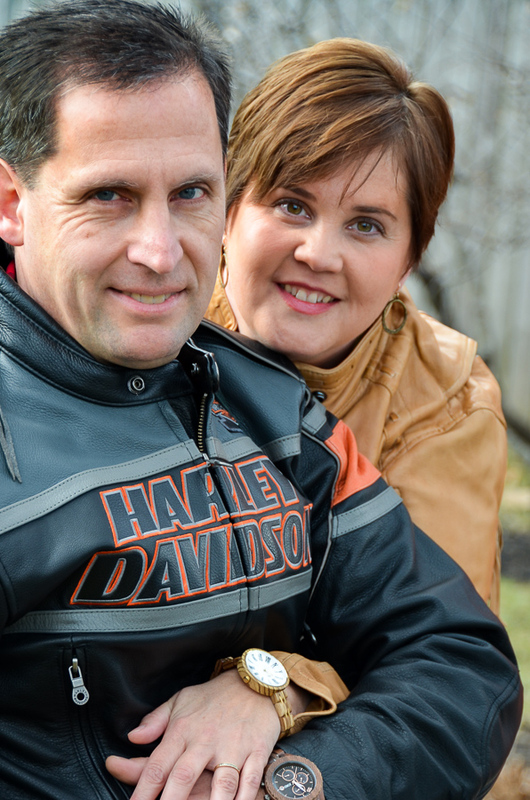 We have one planned – if we ever get to that project! 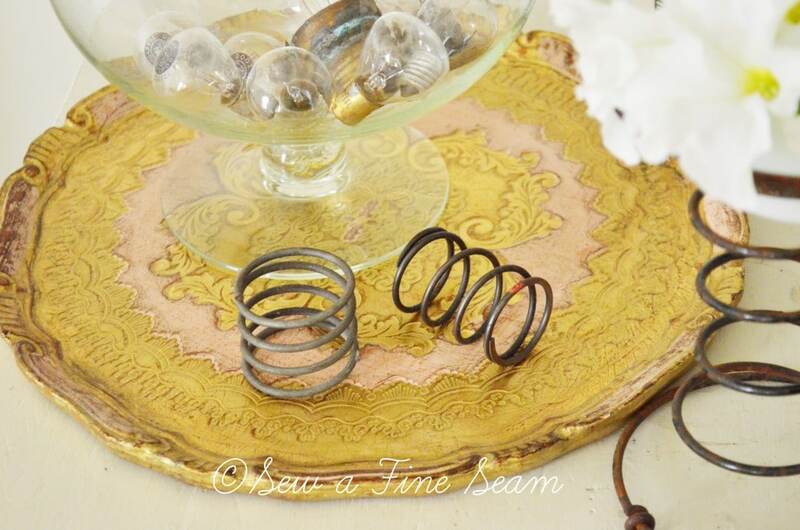 I enjoyed your post and I think the springs are cool accents to your decor. Are the round sealed clear balls little old buoy’s used on the side of boats to keep them afloat? That’s what they remind me of anyways….! The ones I’ve seen are usually found in bright colors and are hooked together by old fishing netting. Thanks Heidi! yes the glass things are buoys. The lady I bought them from said they were used on fishing nets. I don’t think I’ve ever seen the bright colored ones. that would be cool too! I “get it”! And I wish you had an on-line store so I could buy a couple of the bed springs and more of your great old “junk” finds! Thanks Linda! I do have an etsy shop that has been sadly neglected this summer. 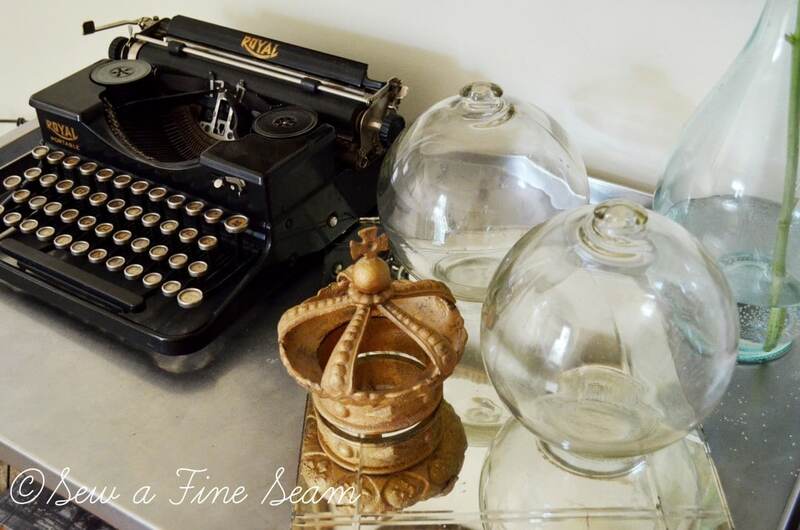 I should get it cleaned out and dusted off and list some small vintage items again – I sold most of the ones i had listed early this year along with my handmade stuff. Adorable! Crumbs, not I am seriously cross with myself for not picking up those yardsale bulbs. I get it. 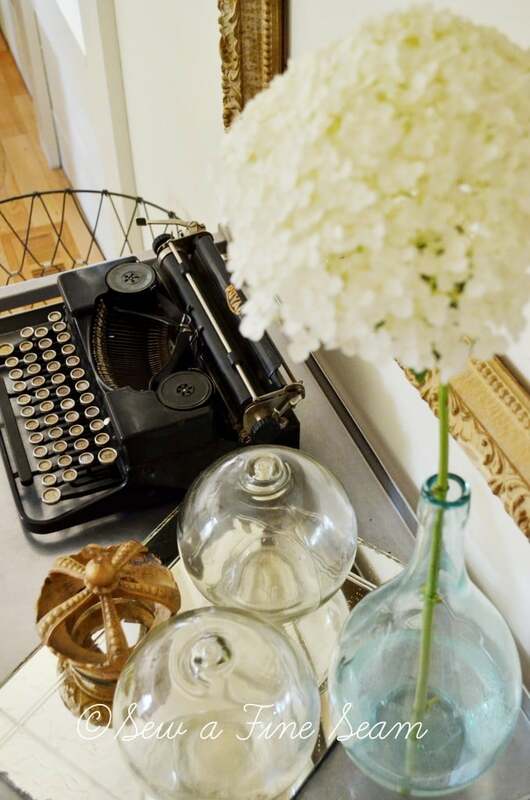 I love the eclectic look of using ordinary things in an interesting way. Thanks Amy! The glass things are old fishing bobbers! How cool is that?! 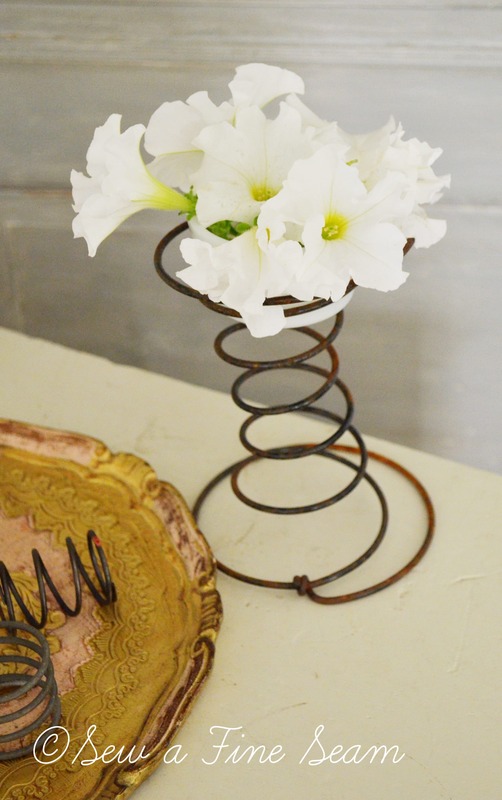 When you bought the bedsprings at the auction, I had no idea what you would do with them, but I also had no doubts that you would do something neat. And, of course, you did. And, now I want some!! Grandpa would be so pleased that you liked some of his “junk” and would really enjoy seeing what you’ve done with it. I have plenty of springs! They are all still bundled together with heavy wire and I need Travis to get them cut apart for me. I’ll get you some this fall! I’d love to float my floats in a little fountain/pond someday! Wouldn’t it be cool to find these floating in on the tide?! 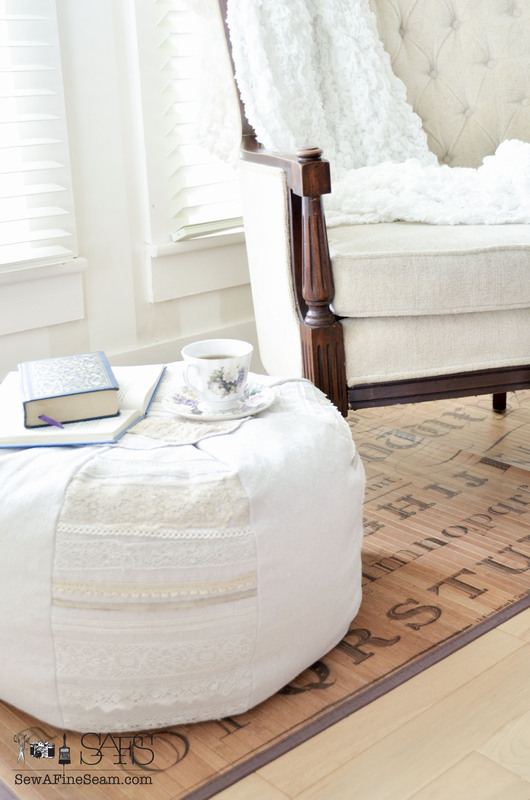 Sweet vignette, amazing how charming “old things” can be! I would love to find some old bed springs, for crying out loud, what next huh? Glad you found some at your Grampa’s shop. How awesome. It would be neat to be able to ask him what he’d do with them. I’ll have to see where I can find some. Have seen them used for cupcake stands, snack stands. The flowers look really pretty, contrast of industrial with pretty is awesome. I’ve just spend an hour fiddling with pc and internet connection. We are very limited out here what we can get. We had Century link but had nothing but problems with them. Finally got sick of it and called Hughes Net. Dish advertises they have their internet everywhere but that’s not necessarily true. The only one they’ve subcontracted with for internet out here is Hughes net, grrrr. The router we had to get isn’t strong enuf I guess so I have to keep uninstalling it and then install it again, the connection thing doesn’t work right, grrrr. I don’t do well with things like at as I have no idea what to really do, very digitally challenged, darn it. Finally got it working again after 3 times of uninstalling and installing it. Can’t afford to go buy another router with the connector again. When guy came to install the satellite he didn’t bother to tell us we had to get router set up. We had to find out when he was done and ready to leave. Had to figure it out for ourselves. Wish so much we could get the cable but it’s not out here yet, not for long time they said. It’s nice to live out here away from town but it’s like we’re being punished for the privilege. Ah well. I hope you find some Jane! And I hear you on internet service being frustrating. Ours shouldn’t be a big deal where we live but we changed something a few months ago because they said it would be BETTER but it is WAY WORSE 🙁 I was not happy. I’d like to go cable but my hubby hasn’t taken the time to get it done. Guess I’ll have to do it myself.